What do you call that green garnish on your plate (that you probably will just flick with your spoon)? Is it parsley? Or is it cilantro? Hmm. Tricky, right? Parsley (especially the flat-leaf kind) looks so similar to cilantro that it’s so easy to incorrectly interchange them. However, the two are completely different when it comes to taste and usage and we will explain the difference between parsley and cilantro in this article. Parsley, scientifically known as Petroselinum crispum, is a kind of aromatic herb with pointy, dark green leaves known for its mild flavor. It belongs to the Apiaceae family. Parsley is cultured as a biennial plant in areas with a mild climate but is grown as an annual plant in areas with tropical climates. Parsley flourishes in moist, loamy, well-turned soil under the heat of the sun. If grown indoors, it has to be placed near a sunny spot or near a window. There are two kinds of parsley. 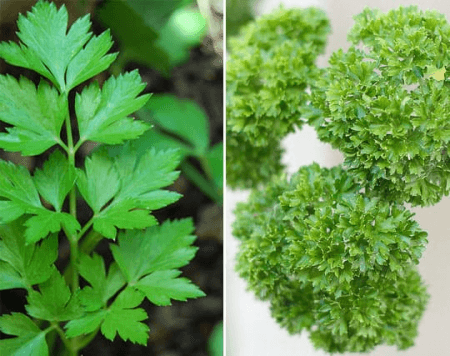 The more famous one is the curly leaf parsley, which is typically used as a garnishing because of its beautiful ruffled leaves. It is rarely used to flavor dishes because it has a very mild flavor. The other kind is the flat leaf parsley, also called “Italian parsley, ” which is often mistaken as cilantro because of its leaves. Flat leaf parsley is a lot easier to cultivate as it is adaptable to rain and sun. According to many, it also has a stronger flavor than the curly kind. Aside from being used as a garnish, it is also minced and sprinkled on soups, rice, and salads. It also adds flavor to vegetable omelets, chimichurri sauce, and several other dishes. Packed with vitamins and minerals, parsley is a rich source of folic acid, luteolin and vitamins A, C, and K.
Cilantro, also called “Chinese parsley” or “coriander” in the UK, is a kind of herb with curved, three-lobed, serrated, light green leaves. It is scientifically known as Coriandrium sativum and is a member of the Apiaceae family. It is an annual plant that grows best in sunny areas with full or partial sun and well-drained soil. The leaves, roots, stems, and seeds of cilantro are all edible. Its leaves have a very powerful citrusy flavor, which many people think is “soapy.” When crushed, its seeds (called coriander seeds in the US) add a warm, spicy flavor to the dish. Additionally, its roots have a powerful taste and aroma and are widely used in Asian recipes. Because of its intense flavor, cilantro is typically used in small amounts. It is used in curry recipes, salsas, salads, soups, chutneys, and other flavorful dishes. Cilantro is full of health benefits. It has a high level of iron, fiber, and magnesium. It is also believed to have antibacterial and antimicrobial properties. What, then, is the difference between parsley and cilantro?